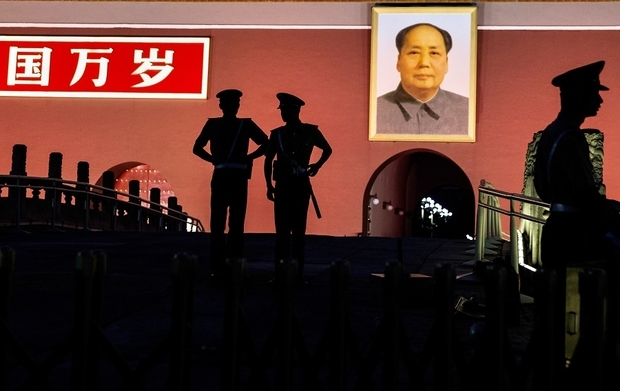 Chinese paramilitary police officers stand guard below a portrait of the late leader Mao Zedong in front of the Forbidden City at Tiananmen Square on June 4, 2014. In China, politics continues to control law. The current leadership has rejected many of the universal legal values that China accepted—at least in principle—under communist rule in some earlier eras. Today, for example, to talk freely about constitutional reform, even within the sheltered confines of universities and academic journals, is not a safe enterprise. And discussion of judicial independence from the Communist Party at the central level is a forbidden subject. In Beijing, reportedly, many judges have recently resigned in order to find other work, as lawyers, in business, or in academia. When discussing domestic legal reform in China, it’s useful to keep in mind the huge strides that the contemporary Chinese legal system has made since its calamitous beginnings. The first three decades of the People’s Republic of China, from 1949 to 1979, were a legal disaster. By 1957, the decision of ruling Communist Party leader Mao Zedong to import the Soviet legal model—a socialist version of a continental, Western European legal system—proved a failure. Three major periods of ideological turmoil—the Anti-Rightist Movement of 1957-58, the Great Leap Forward that immediately overtook it, and the Cultural Revolution that started in 1966—demolished any attempt at a formal legal system, Soviet or otherwise. After Mao’s death in 1976, when Party leader Deng Xiaoping decided to change the country’s political and economic course, China made another attempt at law reform, reviving the Soviet model. But Deng built upon it, adding Western legal elements and, to a considerable extent, opened China to universal legal values and practices. Since 1979, despite political changes and sometimes harsh repression, China has witnessed the construction of a comprehensive legal system. The Chinese have enacted a large body of legislation covering most subjects and very quickly created a legal environment robust enough to attract foreign direct investment, trade, and technology imports. They have also built up the institutions and the personnel necessary to apply this new body of legislation: There are roughly 200,000 judges and a similar number of prosecutors, as well as a large number of legal administrators in the Ministry of Justice and other government agencies at the national, provincial, and local levels. There are now over 250,000 lawyers, and every substantial Chinese business, whether state-owned, private, or mixed, must have legal advice, with most of the larger ones having their own in-house counsel. In response to these needs, a highly developed system of legal education is in the process of producing many more professionals. This is a significant accomplishment within a mere 37 years. When I first visited China in 1972, there was virtually no legal education—because of the Cultural Revolution, universities there were shuttered for a decade. Now there are almost 700 law schools and university departments (too many perhaps to adequately provide good teachers). Moreover, this legal education has been heavily influenced by the West, especially the United States, at least until very recently, and every year several hundred thousand people take the national bar examination, which only passes a small percentage. Yet it’s not clear whether China can go on from here to build what we would recognize as a more predictable, reliable, and independent legal system. Today there is a huge amount of popular dissatisfaction with the judicial system, which handles over 14 million cases a year. People realize the local courts are full of corruption. Local protectionism makes courts less open to fair adjudication for interests that come from outside their immediate geographic area. Guanxi—the influence of relatives, friends, and contacts—is the biggest problem. Whom did judges go to high school with? Who is their cousin? Who is a friend of a friend? These questions permeate the system and often undermine fair adjudication. And, of course, political interference is pronounced. Local government or Party officials, or members of the local people’s congress, use their low-visibility powers to adversely affect what might otherwise be independent, fair judgments. Dissatisfaction also runs high within the ranks of the legal system itself. The very success of over three decades of legal education and practice has created a new legal elite. Thus a large number of people—legislative staff, judges, prosecutors, lawyers, administrators, legal scholars, and even police—want to inhabit a real legal system, not one that has the appearance of integrity but functions arbitrarily. They take legal reforms seriously and know that it is necessary not only to enact good rules, but also to implement them. In China, as many people have observed, faithful implementation is the name of the game, but it remains extremely difficult. Unfortunately, new judicial reforms may prove disappointing. Many younger judges are quitting because their career prospects are restricted by the manner in which court reforms are being carried out, favoring older, often less-qualified, but more ensconced cadres who are unlikely to enhance the prestige and authority of the courts. The relationship of the Party to the legal system is an issue that will not disappear. In principle, the Party controls the legal system at every level; the central political-legal commission, which operates on behalf of the Party Central Committee and its politburo leaders, tells every legal institution what to do. But there are internal debates about how far its reach should extend and which government agencies should have the Party’s judicial ear. Traditionally, the Party has allowed the main police agencies—the Ministry of Public Security and the Ministry of State Security—to exercise far more influence over the criminal process than the Ministry of Justice, the prosecutors (the procuracy), and the courts. There have been some recent renewed efforts to limit Party influence over judicial decision-making in individual cases and to reduce the relative influence of the police in the process. Given the low level of transparency in China’s legal realm, however, progress on this front is difficult for outsiders, especially foreigners, to track. Ironically, China’s constitution is, in many respects, a reasonably well-developed document—the problem lies in its lack of enforcement. Attempts have often been made to enforce it in the courts, but, despite periodic wavering, the Party has rejected them. The constitution, according to its terms, is to be interpreted and applied by the Standing Committee of the National People’s Congress. Occasionally, human rights lawyers and activists have petitioned to obtain the Standing Committee’s interpretation, but it is not eager to undertake its authorized role. This doesn’t mean the document is meaningless. It sometimes exerts indirect and subtle influences on the way inter-governmental questions and political discussions are handled, and even on the way that courts respond to certain claims. And it is useful for the Chinese people to at least know that they are supposed to be guaranteed freedoms of speech, assembly, demonstration, and association, as well as freedom from arbitrary detention. These constitutional guarantees can become standards for the future. The immediate future looks dim for legal reform in China. A little-known fact highlights what might have been. Xi Jinping’s father, the famous political leader Xi Zhongxun, was placed in charge of the country’s legislative reform from 1981 to 1983 after returning from many years of ostracism and vilification during the Cultural Revolution. Bitter experience had led the elder Xi to recognize the importance of freedom of discussion, allowing people within the Party and outside the Party to speak freely, even if their ideas contradicted the policies and programs of the current leadership. He advocated enacting a law to protect differing opinions and to prevent people from suffering criminal punishment, or ousting from the Party, or other sanctions for expressing disagreement with the leadership. The elder Xi openly recognized that, in order to maximize progress, China had to allow differences of opinion. Today, sadly, his son rejects that good example and demands “absolute loyalty” from would-be law reformers—and everyone else.